WHERE ARE KASK HELMETS PRODUCED? All KASK products are 100% made in Italy and pass through the most rigorous safety and quality tests of KASK’s distinctive CSD Project – Comfort, Safety, Design. All KASK’s exclusive designs and product features implemented in the helmet collections are absolutely innovative, proprietary, and protected by numerous patents. KASK does not compromise when it comes to quality and safety. Every KASK product you purchase will ensure your satisfaction and safety. WHAT KIND OF CERIFICATIONS DOES THE HELMET COME WITH? HOW OFTEN SHOULD A HELMET BE REPLACED? The helmet’s life depends on various factors which cause deterioration, including sudden temperature changes, the degree to which it is exposed to sunlight, and the intensity of use. Inspect the helmet regularly to check for any damage! Cracks, detached parts, warping, flaking and changes in color are significant elements for verifying the helmet’s state of deterioration; in any case, we advise replacing it after approximately 3 years, because over time its capacity for protection decreases due to the aging of the materials. The manufacturing date is shown inside the helmet. SHOULD THE HELMET BE REPLACED AFTER A CRASH? After any violent impact, even if no damage is visible, the helmet should be replaced because its capacity to absorb further impact could be impaired. CAN I CUSTOMIZE MY HELMET? Do not apply adhesives, solvents, stickers, or paint that do not comply with the manufacturer’s specifications. Any alteration or intervention not provided for may impair its protective function. KASK offers different possibilities of personalization. You can choose the helmet you like and personalize it with a flag, Swarovski elements®, leather, or custom logos. HOW DO I CHOOSE THE RIGHT SIZE HELMET? The choice of helmet must be based on its technical and performance characteristics, combined with comfort and design. Tips for choosing a helmet: 1. The first thing to do is to wear the helmet for a few minutes, to see if it fits well or if it causes pain in any particular place. 2. Once it has been put on, simulate movement to test its comfort. 3. The helmet, once secured, must be comfortable, but it should not move. 4. When fastened, the strap and buckle must allow movement of the neck. 5. Always check safety and comfort and choose the model you like best! The size of the KASK helmets corresponds to the circumference of your head! You can use a tape measure, positioning it just above the ears, and taking note of the measurement in centimeters. CAN I WASH THE INTERIOR OF MY HELMET? To ensure the best comfort and hygiene, the padding is easily removable and washable. The pads are also sold separately as accessories. HOW LONG IS THE WARRANTLY OF THE KASK HELMET? SPORT KASK guarantees the product for 2 years from the date of purchase for defects in materials or workmanship. The warranty excludes defects due to normal wear and tear, modifications, incorrect storage, improper maintenance, or use other than that for which the device has been certified. 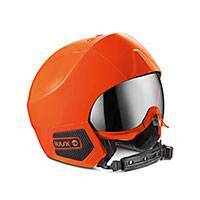 Where are KASK helmets from? All KASK products are 100% designed and made in Italy and pass through the most rigorous safety and quality tests. All KASK’s exclusive designs and products features implemented in the helmet collections are absolutely innovative, proprietary, and protected by numerous patents. KASK offers different possibilities of personalization. You can choose the helmet you like and personalize it with a flag, Swarovski elements, leather, or custom logos. What is the Fit System? KASK’s patented self-adapting adjusting system in carbon look, introduced for the first time in the equestrian market, allows the helmet to perfectly and automatically fit to the rider’s head by gently cradling the back of the head. The high-tech carbon look of this detail highlights the design and the innovativeness of the product. To ensure the best comfort and hygiene, the padding is easily removable and washable. Hand and machine washable at 85° F. The liners are also sold separately as accessories. How long is the warranty of the KASK helmets? KASK products are guaranteed for 2 years from the date of purchase. KASK assumes responsibility to repair or replace a helmet that presents faults or manufacturing defects attributable to the manufacturer. In this case, it is necessary to return the product to KASK together with a documented proof of purchase. Must the helmet be replaced after a crash? Following violent impact, even if no damage is visible, the helmet must be replaced, as its capacity to absorb further impact could be impaired. Who can I contact in case of a crash? 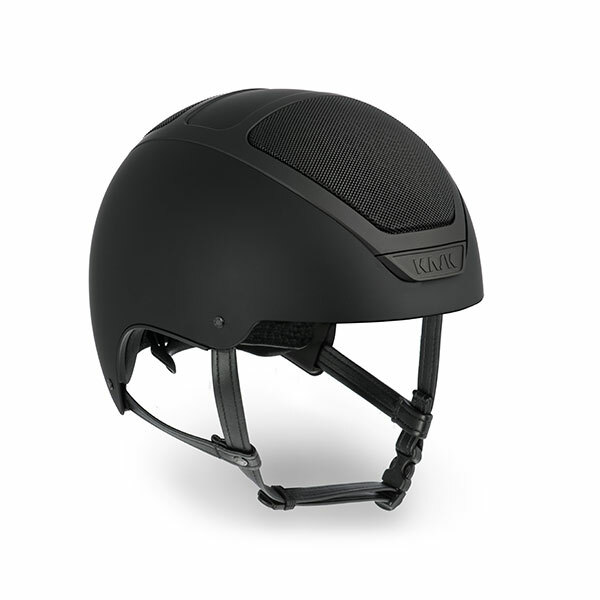 KASK offers the Crash Replacement Policy, a discount towards the purchase of a new KASK Equestrian helmet for up to 24 months from the purchase date. The rider must send back the helmet involved in the accident along with KASK’s Crash Replacement Form and a proof of purchase. All returns must be accompanied by a Return Authorization Form and a Return authorization number that can be obtained by sending an email to info@kask.it. After how long must the helmet be replaced? The helmet’s life depends on various factors which cause deterioration, including sudden temperature changes, the degree to which it is exposed to sunlight, and the intensity of use. Inspect the helmet regularly to check for any damage! Cracks, detached parts, warping, flaking, and changes in color are significant elements for verifying the helmet’s state of deterioration; in any case, we advise replacing it after approximately 10 years, because over time its capacity for protection decreases due to the aging of the materials. The manufacturing date is shown inside the helmet. The helmet’s life depends on various factors which cause deterioration, including sudden temperature changes, the degree to which it is exposed to sunlight, and the intensity of use. Inspect the helmet regularly to check for any damage! Cracks, detached parts, warping, flaking and changes in color are significant elements for verifying the helmet’s state of deterioration; in any case, we advise replacing it after approximately 3 years, because over time its capacity for protection decreases due to the aging of the materials. The manufacturing date is shown inside of the helmet. Do not apply adhesives, solvents, stickers, or paint that do not comply with the manufacturer’s specifications. Any alteration or intervention not provided for may impair its protective function. HOW DO I CHOOSE THE RIGHT HELMET? The choice of helmet must be based on its technical and performance features, combined with comfort and design. We suggest some steps in order to choose the right one: 1. Wear the helmet for a few minutes, to see if it fits well or if it causes pain in any particular place. 2. Once it is on your head, simulate movement to test its comfort. 3. The helmet, once secured, must be comfortable, but should not move. 4. When fastened, the strap and buckle should allow movement of the neck. 5. Always check safety and comfort and choose the model you like best! The size of the KASK helmets corresponds to the circumference of your head! You can use a tape measure, positioning it just above the ears and taking note of the measurement in centimeters. CAN I WASH THE INNER PADDING OF MY HELMET? To ensure the best comfort and hygiene, the padding is easily removable and washable. HOW LONG IS THE WARRANTY OF A KASK HELMET? KASK SPORTguarantees the product for 2 years for defects in materials or workmanship from the date of purchase. The warranty excludes defects due to normal wear and tear, modifications, incorrect storage, improper maintenance, or use other than that for which the device has been certified.